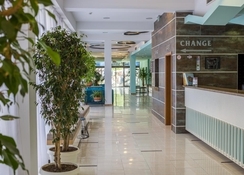 This stunning complex enjoys a privileged situation at the very centre of Sunny Beach and offers the ideal setting to discover the Black Sea Coast. Guests will find the beach 100 metres away and a large choice of restaurants, bars, and entertainment options are close to this enchanting complex. The establishment features a large choice of comfortable accommodation units ranging from completely equipped rooms to spacious apartments. They all come with private balconies and complimentary Wi-Fi internet connection, ideal for those needing to stay connected. Guests staying at this enchanting establishment will appreciate the excellent dining facilities including a main restaurant and poolside bar, where guests can savour some delicious Bulgarian specialities. The wellness area features a fully-equipped gym and sauna, ideal for a work-out with a relaxing finish. 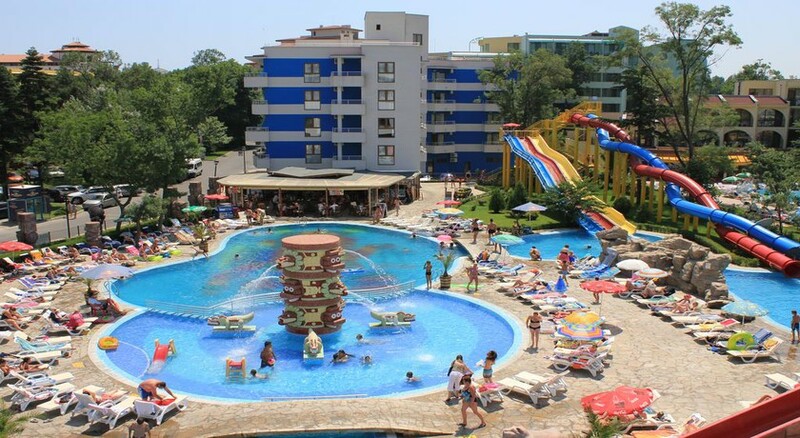 General Description: Kuban Resort & Aqua Park in Sunny Beach has 253 rooms, spread over 20 floors. The sandy beach is 150 m from the hotel and the town of Bourgas is 40 away. To make your stay more comfortable a lounge, a lobby, a reception, an elevator, shops and a mini market are available. The staff in this 20 storey hotel speaks Russian, German and English. 3 fresh water swimming pools with an integrated children's pool are available. Refreshing drinks are offered at the pool bar. Sunshades and sunbeds are available for an additional fee at the beach and free of charge at the pool. Accessible from the hotel: horse riding (10 km), airport BOJ (30 km), disco (15 m) and train station (35 km). 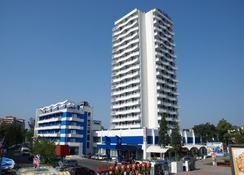 The hotel is within easy reach of city centre, medical services, supermarkets, bus stops and tourist information. For your entertainment the hotel features a casino. Vehicles may be parked in the parking lot. Amenities: For convenience the following services are offered: laundry service, ironing service, currency exchange and a safe. This family friendly hotel offers a children's pool to ensure a comfortable stay for parents as well as young guests. Reception hours: 24h Service. Meals: Breakfast it is provided from 07:30 - 10:00 in the following variations: Continental, Buffet. Guests are welcome to enjoy their meals at the restaurant. Evenings can be spent at the lobby bar. Sport and Leisure: A variety of activities are provided by the hotel such as darts and billiards. Guests who wish to be active on holiday can enjoy activities such as exercise in the fitness room. Wellness and health facilities are offered where guests can relax in a steam room, at a Turkish bath and in a sauna. Additional Information: The following payments are accepted: Euro/Master Card and Visa Card. Additional fees may apply for certain facilities, amenities or activities. Food and drinks were lovely, hotel was clean and tidy! Great hotel and great holiday!